America's most talked-about train, the California Zephyr was inaugurated March 20, 1949, book-ended by the world-class skylines of Chicago and San Francisco. Operated in partnership over three railroads; Chicago, Burlington & Quincy, Denver & Rio Grande, and Western Pacific, the train was designed in Art Deco style and built of Shotwelded stainless-steel by the Budd Company. The California Zephyr incorporated the best of the Zephyr fleet including Vista-Dome coaches and Vista-Dome observation cars. Powered by General Motors diesel locomotives the western themed "land-cruise" train traveled 2,532 miles on its journey from Chicago traversing the spectacular Colorado Rockies via the 6.2-mile Moffat Tunnel and California's magnificent Feather River Canyon - by daylight in both directions. Vintage equipment diagrams include California Zephyr baggage car, Vista-Dome coach, Vista-Dome buffet-dormitory car, dining car, bedroom-cabin car and Vista-Dome bedroom-buffet-lounge-observation car. 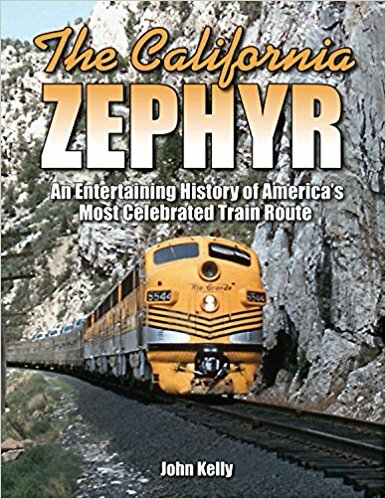 Other highlights feature original trip reports by "Zephyrette" hostesses, travel brochures, timetables, dining car menus and full-color photo gallery of the stunning California Zephyr.